TPE law firm signed a Memorandum of Agreement to handle NHMFC’s non-performing loans. (L-R) Ms. Godiula T. Quinto, Finance and Accounting Admin. Head; Mr. Adornico Redondo, Officer-In-Charge, Central Office Collection Management Department; Dr. Felixberto U. Bustos, Jr., NHMFC President; Atty. 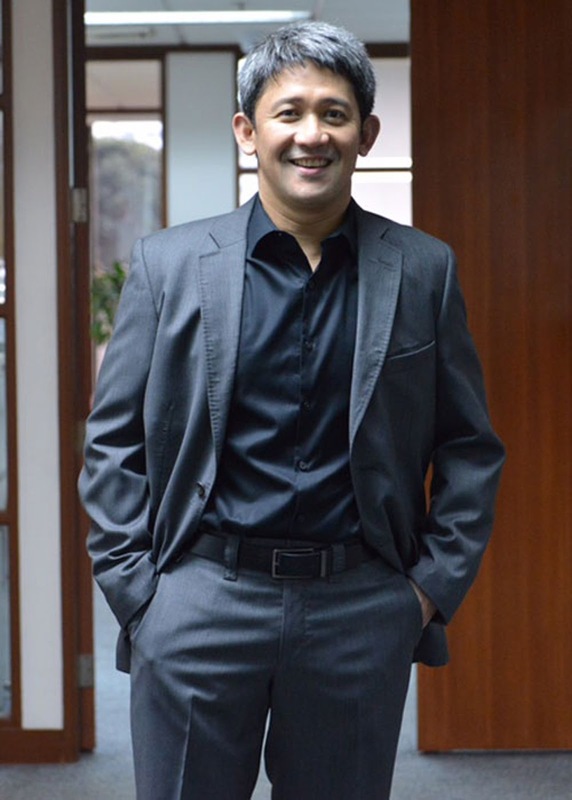 Lamberto T. Tagayuna, Managing Partner and Atty. Elmar A. Panopio, Partner. The National Home Mortgage Finance Corporation (NHMFC) and Tagayuna Panopio Escober Law Firm (TPE) recently signed a Memorandum of Agreement (MOA) that allows the law firm to handle the corporation’s non-performing loans (NPLs). The MOA allows TPE to restructure the corporation’s NPLs for improved collection efficiency and reduction of non-performing assets. Mr. Adornico Redondo, Officer-in-Charge for the Central Office Collection Management Department and Chairman for the Collection Service Partner Coordinator & Account Management Unit, requested the accreditation of additional service partners to support NHMFC in the implementation of the program. “We are honored to have you on our league of partners”, added NHMFC President Dr. Felixberto U. Bustos, Jr. He also mentioned that TPE is an experienced outsourcing law firm that handles collection services of different government and private institutions. Atty. Lamberto Tagayuna, Managing Partner of TPE, acknowledged NHMFC for recognizing their services. “We thank all of you and we are very happy that you accredited us and gave us the trust and confidence”, he said. TPE will be joining the roster of three other law firms, S.P. Madrid and Associates, Alexis A. Molaer Law Office, and Lauron Delos Reyes and Partners, in helping the corporation handle its non-performing accounts. 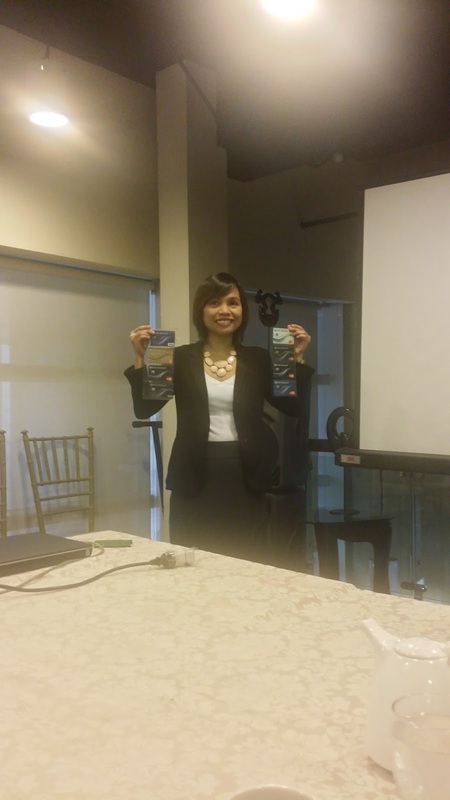 RCBC Bankard Services Corporation is set to present the new design of the RCBC Bankard credit cards. The new design features 4 wave vectors and hexagons lining the top and bottom portion of the EMV chip embedded credit cards. 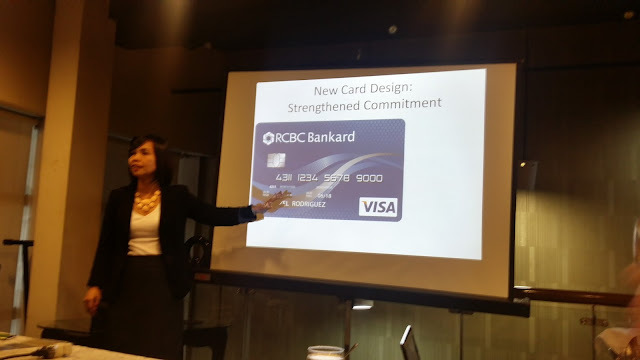 “As we start converting to EMV cards, it very opportune for us to introduce a new card design, which conveys the exceptional benefits our cardholders get from their RCBC Bankard.” said Ms. Angela Mirasol, Vice President and Marketing Group Head for RCBC Bankard. The four wave vectors represent better budget management, a rewarding credit card experience , world class travel privileges, and secure shopping, both in-stores and online. RCBC Bankard prides itself in developing award-winning budget management tools including the Spend Monitor, a free SMS alert feature that informs the cardholders once they are about to reach their predefined monthly budget. Spend Analyzer, which summarizes the cardholders’ monthly and year-to-date spending according to categories. Unli 0%, which allows cardholders to convert their straight purchases to three months 0% installment, by simply calling RCBC Bankard’s Customer Service number. It also boasts of a rewarding credit card experience through its most flexible rewards program that allows the cardholders to shift from earning points, to earning AIRMILES, to getting cash rebates. Recently, it also introduced the All-in Rewards Program, which allows cardholders to earn points from partner establishments on top of the points that they earn from their card’s rewards program. RCBC Bankard partner establishments include Petron, Figaro, Angel’s Pizza, Florsheim, Jellybean, Folded & Hung, Naturalizer, and the Cravings Group. RCBC Bankard also provides a luxurious travel experience for its cardholders with its top-of-the-line travel privileges across all card brands. They can call concierge service for info that they may need when travelling abroad, and relax at the luxurious Miascor lounge at NAIA 1 while waiting for their flight. Further, it comes with a free travel insurance and Purchase Protection Insurance for unforeseen events. On top of all of these, cardholders can enjoy heightened security with EMV technology. Unlike the traditional magnetic stripe feature, EMV chips randomly generate unique codes in every transaction, making it more challenging to duplicate and use. On the other hand, for online shopping, the solution lies in the ShopSecure feature which allows cardholders to nominate their online Personal Identification Number (PIN). Alternatively, they can get a Webshopper, a reference device specifically for online shopping. RCBC Bankard Services Corporation issues and manages the RCBC Bankard portfolio in behalf of Rizal Commercial Banking Corporation, one of Philippines largest private universal banks. RCBC and RCBC Bankard Services Corporation are members of the Yuchengco Group of Companies (YGC), a conglomerate composed of close to 60 companies across a wide spectrum of industries including banking, insurance, education, real estate, construction, information technology, energy resources, advertising, and more. Fresh from the recently concluded 12th International Dragon Boat Federation (IDBF) World Championships held in Welland, Ontario, Canada last August 18-23, the Cobra-PAL Philippine Dragon Boat Federation (PDBF) team wins 4 gold medals under four divisions for the 200M and 500M mixed categories for small boat event. “We have once again showcased Filipinos’ inherent world-class talent; that we are built to endure, survive, and succeed in global competitions. Today is one of those moments when we are very proud to be called Pinoys. The whole team channeled their Tunay na Lakas para sa Pilipinas,” Marcia Cristobal, PDBF President, proudly shares. The Philippine paddlers left the country Monday targeting only 3 gold wins, but came home with a sweet victory of 4 gold medals. Besting rival countries Macau, Hungary, Italy, and Puerto Rico for the 500M premier mixed with the best time of 4:26.942 and senior A mixed with the best time of 4:53.905, the Cobra-PAL rowers emerged as the champions in the 200M and 500M Mixed divisions for the Small Boat category. A few months after the celebrated homecoming of the LG G4 in the Philippines, mobile technology innovator LG Electronics introduces a new member in what seems to be an LG G4 family in the works. 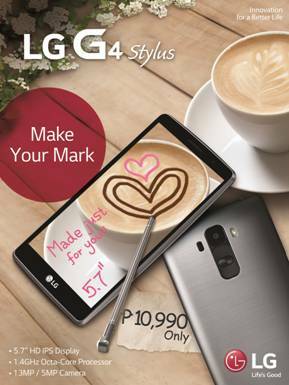 Bearing almost similar features as the flagship LG G4, LG Mobile Philippines introduces the LG G4 Stylus. The LG G4 Stylus inherits the arc shaped body similar to the flagship smartphone; the slim arc design allows for perfect comfortable grip of the user preventing the device to slip and drop from your hand. 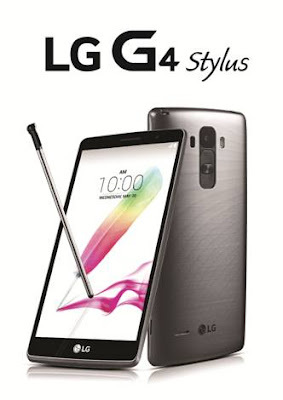 Take note though that the G4 Stylus is a phablet that has a relatively larger screen compared to the flagship. With a zero-gap in-cell hybrid touch technology with 5.7-inch HD IPS screen 720p display, the G4 Stylus is the perfect handset for those who value better viewing experience for games and movies or for those who take notes seriously. As the name suggests, the LG G4 Stylus comes with an enhanced rubberdium stylus pen perfect for taking down notes and memos. Enjoy the 5.7-inch screen and scribble and doodle away on the built-in Quick Memo+ application on the G4 Stylus. The enhanced stylus pen works together with in-cell hybrid touch technology which makes the screen more responsive to touch contact and lets you surf the net with maximum ease, write down notes, draw, edit photos, and color with such accuracy and precision. Both the young and the old can make the most of the stylus pen with coloring book apps like Colorfy available in Playstore becoming a trend today. The G4 Stylus carries staple features such as the functional rear keys, Gesture Shot, Knock Code, as well as Glance View, and Front Camera Light for better selfies. The G4 Stylus maintains its removable back plate which reveals a microSD card slot to further expand its built-in 8GB of internal memory. It also features a 13-megapixel rear camera with Laser AutoFocus and a 5-megapixel front camera, Dual SIM functionality, 1.4 GHz Octa-core processor, 1GB RAM, exceptional 3,000mAh battery life, and Android 5.0 Lollipop OS out of the box. The G4 Stylus retails at Php 10,990 and comes in Titan Black and White. To learn more about LG G4 Stylus, visit www.lg.com/ph; like LG Philippines’ Facebook page; or follow @LGPhilippines on Twitter and Instagram. The ultimate connectivity and entertainment experience can be found right at home with PLDT HOME’s contemporary suite of digitally connected services. The leading broadband and digital services provider wraps up the first half of 2015 with a fresh and power-packed lineup, treating families to an ensemble of strong connectivity options and the most popular movies and TV shows all from their monthly subscription. 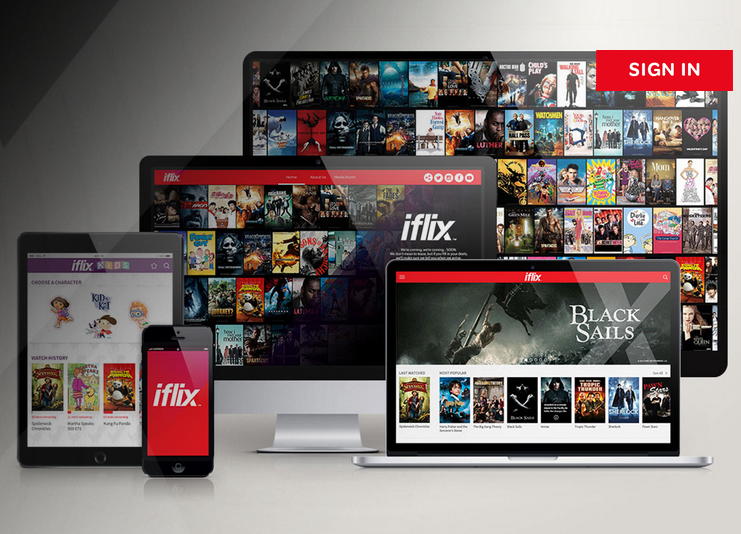 PLDT HOME joined forces with Smart Communications to establish the Entertainment Everywhere movement, first introduced through their breakthrough tie-up with Southeast Asia’s leading Internet TV service iflix. Families are given the sweet escapes and binge-watching moments they deserve with hit TV series and movies from the best content providers from around the world including top Hollywood, European, Asian and even local studios. Entertainment Everywhere was levelled up immediately after with PLDT HOME and Smart’s partnership launch with Fox International Channels, a global entertainment company and Asia Pacific’s leading broadcaster. Offers go beyond subscription video-on-demand (SVOD) content to include live and catch-up television on various Fox channels. Families are thus granted the power to keep up with every moment of the most thrilling sports events through live-viewing and enjoy the most popular blockbusters at their convenience through catch-up TV. 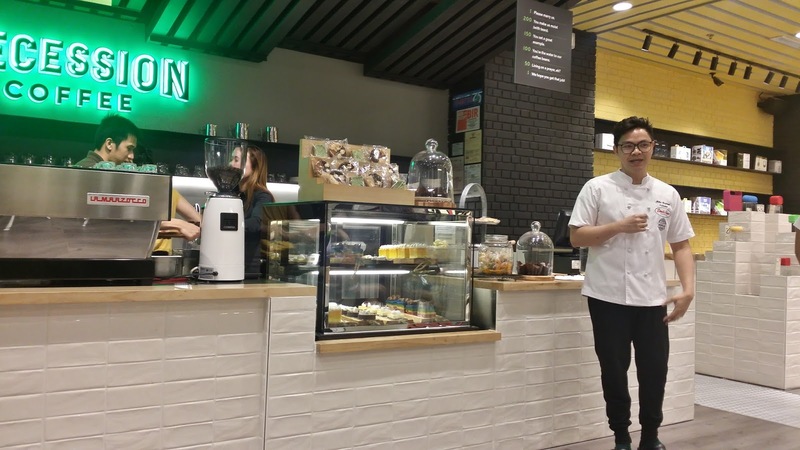 Having maximized its offerings within the home with voice, data and cable television services, the organic next step for PLDT HOME was to add a mobile offer, equipping consumers with the same strong and reliable connection when they step out of the house. 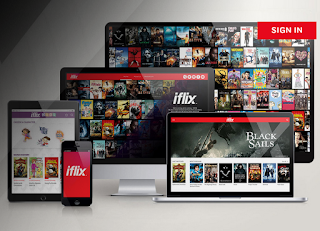 With mobile connectivity completing the country’s first quadplay service, consumers can now also text, call, surf and enjoy iflix and Fox content anywhere and anytime without worrying about sky-high mobile bills. For more information, visit pldthome.com. Brother International Philippines Corporation (Brother Philippines), one of the leading providers of home and business IT peripherals, has recently signed up the University of Southern Philippines Foundation (USPF), a private university in Cebu City, for its Toner Management Program. Brother Philippines’ Toner Management Program is the company’s innovative solution for its institutional or corporate customers. Through the program, customers who sign a two-year toner supply agreement with Brother can avail of its multi-function centres without upfront payment. The program also gives customers the convenience of having the experts take care of the maintenance of the machines, and the replenishment of their printer consumables. This will provide offices a more cost effective way to acquire and operate multi-function centres (printers with other functions like faxing, scanning and copying) in the office. USPF Finance Director Rosalina J. Sepulveda has initially conducted the research on the total printing costs of the university and found out that over the years, USPF’s printing costs soared high without the benefit of statistical data to support the investment. “Moreso, a balance deployment strategy should be in place,” he added. This expansion of Brother Philippines through its corporate business portfolio is aligned with the Brother Group’s strategy to reinforce solutions offering as a pillar of growth. Starting as a sewing machine repair shop in Japan over a hundred years ago, the Brother Group has evolved and grown, and now has manufacturing and sales facilities in over 44 countries and regions worldwide. In photo after the signing of the Brother Color Toner Management Program agreement between Brother Philippines and the University of Southern Philippines Foundation are (left to right): Tekzone Computer Sales and Services Sales Coordinator, Brenna Vito; Brother Philippines President, Glen Hocson; USPF Director of Finance, Rosalina Jereza Sepulveda; USPF President, Dr. Alicia P. Cabatingan; Brother Philippines Deputy General Manager for Sales and Marketing, Masao Kasagi; USPF Chief Information Officer, Lester Gastala; and Tekzone Computer Sales and Services Accounting Supervisor, Zesprela Bingil. Since opening their first futuristic and pop-art inspired store in 2004, Digital Walker set the bar for industrial class and fashion forward digital accessorizing. The aim has been to gear today’s technocrats up with hip, quality, and trailblazing tech accessories so they may walk into the future, ready to get their geek on in super style. Offering a slew of noteworthy music headgear, portable speakers, gizmo guards and a few cult loved gadgets, the true tech-savvy and social geek won’t have to think twice about a single purchase. Pushing the envelope further, the much loved gadget accessory store recently unveiled a new twist in their Eastwood Mall location: Recession Coffee by Digital Walker. Truly a coffee lover’s dream in the heart of Eastwood City, the cafe shares its space with the fun and funky tech store, and have worked closely with the EDSA beverage design group to provide their patrons with the best cup of coffee at whatever price they wish to pay. 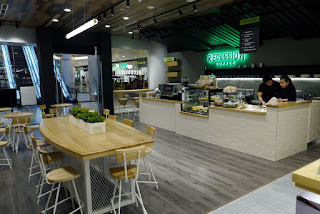 Yes, it’s a pay-what-you-want café. Coffee enthusiasts and purists alike can now have excellent coffee brews. Choosing from a list of Espressos, for example, one may try the aptly named beans “Dark Matter Theory.” For the pour over coffee enthusiasts, a choice selection of Panama Carmen Estate, Ethiopia Sidamo Guji Suke Quto, and Kenya Wakulima grinds are available for discerning coffee-geek connoisseurs to analyze. Pair the cup with colorful, delectable confectionery offerings by Chef Miko Aspiras – or four. They’re delicious. 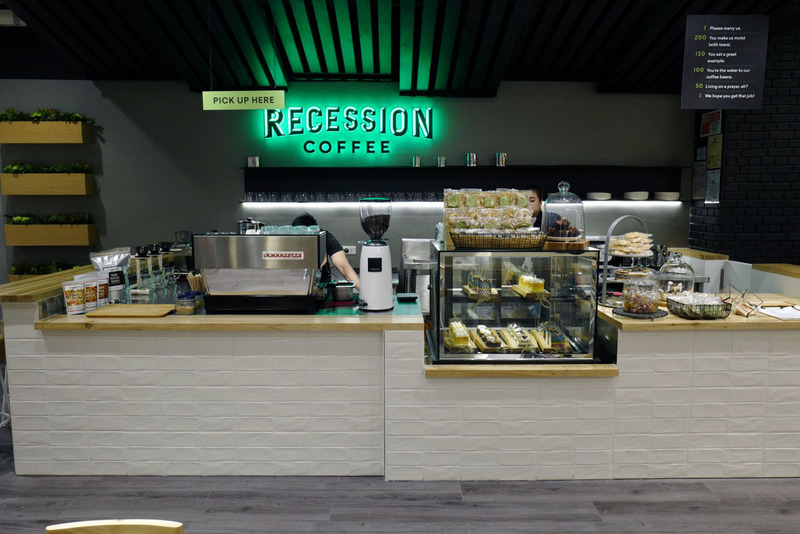 Recession Coffee’s Pay-What-You-Want concept challenges coffee aficionados to show their love for coffee by giving them the freedom to pay as much as they want for a cup. But, because Recession Coffee and Digital Walker have a deep appreciation for a dry sense of humor, it would be good to know that your cup will also get a price badge to poke fun at just how much cash is received. Give an amount greater than P200 and receive a marriage proposal, or contribute P50 and be mistaken for someone in between jobs. So contribute modestly at your own risk. 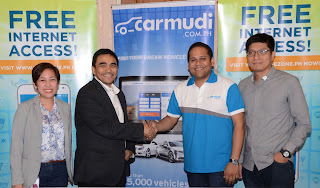 Finding a car that’s within your budget is now made easy, even if you don’t have an active data subscription as vehicle buy-and-sell platform Carmudi is now powered by free Internet platform SafeZone. Fueled by Voyager Innovations, the digital arm of PLDT and Smart Communications, Inc. (Smart), SafeZone allows users to browse SafeZone partner sites and apps completely FREE of data charges. 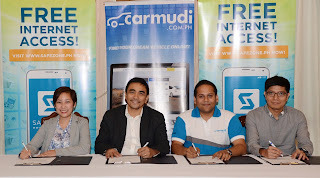 As the number one vehicle marketplace in the Philippines, Carmudi offers listings of over 25,000 vehicles on its website and mobile app, which can be searched using different parameters such as make, model, price, and condition to suit every vehicle hunter. Carmudi is backed by Rocket Internet, and by partnering with SafeZone, visitors of the Carmudi website and mobile app can now search for vehicles without worrying about data charges. “With our growing presence in the Philippines, we want to offer more to our users with our latest partnership with SafeZone. 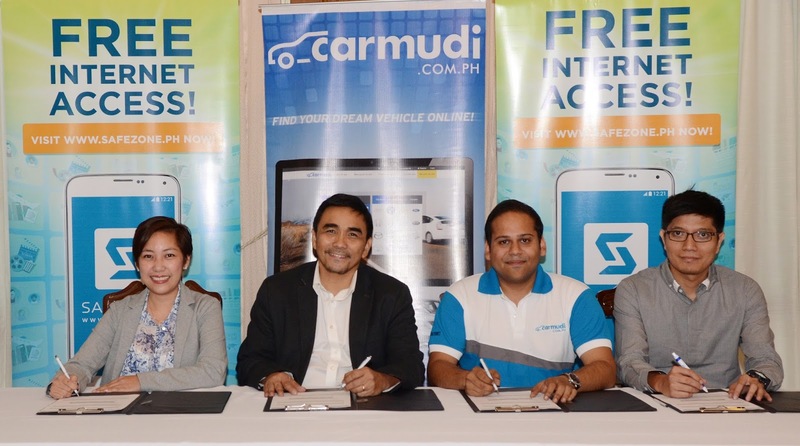 Users of Carmudi no longer have to worry about having load or an active data subscription to search for a car,” said Carmudi Philippines Managing Director, Subir Lohani. “SafeZone allows consumers to access partner mobile sites and apps for free, making internet browsing more enjoyable. 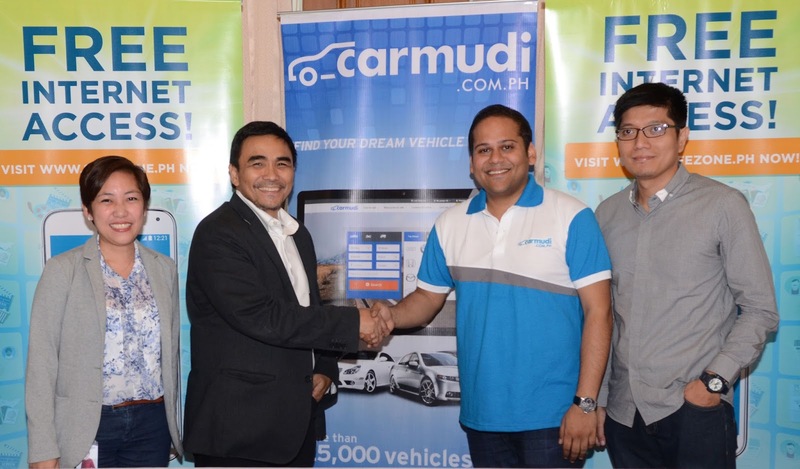 With our latest partnership with Carmudi, Filipinos can now search for a brand new or used car worry-free.” said Benjie Fernandez, the Chief Operating Officer of Voyager Innovations. SafeZone is fueled by Voyager Innovations Inc., the digital arm of PLDT and Smart Communications, Inc. (Smart), which focuses on delivering disruptive innovations for the rapidly changing digital world. To enjoy Carmudi on SafeZone, users may download the Carmudi app from the SafeZone website, turn on the “Load Protect” feature to ensure that no data charges occur, and then use Carmudi as they please. SafeZone is currently available for free to subscribers of Smart, Sun, and Talk ‘N Text. This rainy season, expect your laundry chores to be more challenging as the weather yields more clothes to wash. For busy working people, this means less opportunity to have some R&R, and reduced quality time for the family. 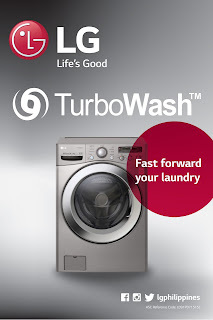 The good news is that spending a lot of time and efforts in doing laundry can now be avoided, as LG’s washing machines with TurboWash and TurboShot technologies are already here to help you clean your clothes fast and easy. 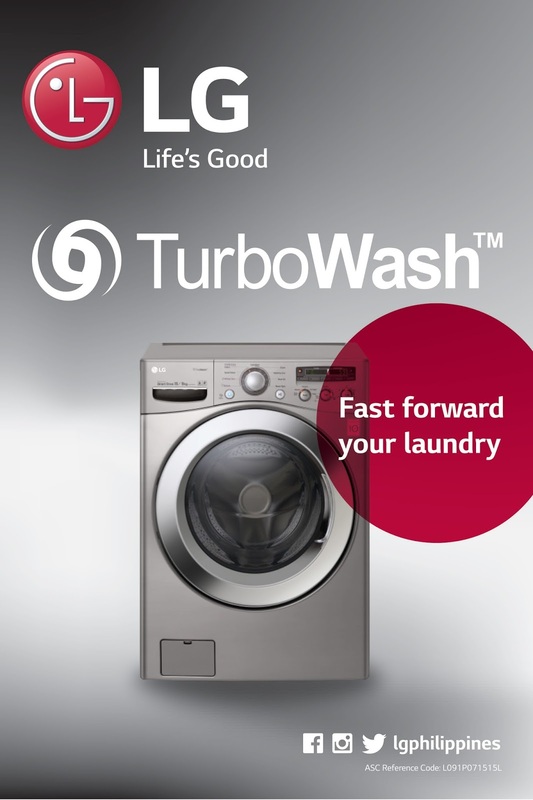 LG's revolutionary TurboWash™ Front Load washers will allow you to reduce washing time on each large load of laundry, without compromising cleaning performance. With the 3 Way TurboWash™, what normally takes almost an hour to finish for a normal speed course can be done in as fast as 45 minutes. 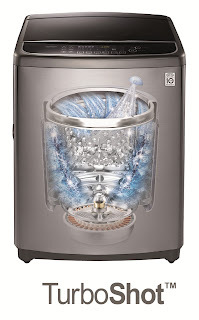 In speed washing function, it can take as fast as 15 minutes to finish a standard of one kilogram laundry load. Shop Anything, Anytime, Anywhere with the Lazada Mobile App! MANILA PHILIPPINES – Lazada (www.lazada.com.ph) - the Philippines’ One-Stop Shopping and Selling destination continues to keep its commitment of effortless shopping to Filipinos with the Lazada Mobile App. Now, Filipinos have access to more than half a million products right at their fingertips. Giving Filipinos the power to shop anything, anytime, anywhere through the Lazada Mobile App. With the Lazada Mobile App, everyone can conveniently shop while on the go; packed with eye-catching visuals, intuitive user interface, and true-to-form images, you can never go wrong shopping through the Lazada Mobile App. Now you don’t need to rush to the mall or brave through the bad weather or heavy traffic as shopping through the Lazada Mobile App is easy as 1-2-3! Simply download the Lazada Mobile App for FREE on iOSAppStore and Google Play Store. Packed with daily promos and jaw-dropping discounts, the Lazada Mobile App also hosts exclusive App-Only sales for premium tech and lifestyle brands. With the same robust functionality as its web interface, the Lazada Mobile App offers the ease and convenience of shopping for those Filipinos on-the-go. And to make every Filipino’s effortless shopping risk-free, the Lazada Mobile App also offers cash-on-delivery payment. So aside from the ease of being able to shop on-the-go through the Lazada Mobile App, everyone can pay via cash when their orders arrive on their doorsteps. · For mobile shopping, choose shopping sites with an app. It’s easier to use and most importantly, more secure as it’s harder to tamper with. · Check news articles about the shopping site to ensure it’s not a temporary online shop that will disappear after pocketing your money. · Ensure the shopping site has a return policy such as Lazada’s Buyer Protection: online shops without return policies can mean scam or unauthentic products. · Do not give your password to anyone. Online shops’ email support or call support personnel should never require your password for identification. · Only use your credit or debit card on sites with a padlock icon in the URL bar. This means the site uses secure communications to prevent any third-party eavesdropping. · Check for security labels such as PCI-DSS certification. This means the shop has been audited and is certified safe to use. · If you don’t receive an acknowledgement email from the online shop shortly after a purchase, there might be an issue with your purchase or it might be a scam. Call the site’s hotline to verify. · If you strongly suspect you have been scammed and your credit card information has been stolen, contact your bank or credit card issuer to block the card and investigate. · Pick the right size by using the size chart feature, taking your measurements and checking carefully for any international conversions (UK, US, EU, Japan). · Ensure the site has an exchange policy like Lazada’s 100% Satisfaction Guaranteed policy that enables you to return clothes within 7 days, and re-order the outfit in a size that fits you perfectly. · Only shop for fashion on shopping apps that provide a few angles so you can see exactly how the clothes fit on the model or mannequin. · Get your friends’ comments or ‘likes’ easily by sharing the item on Facebook or Instagram before buying. · Read product details to check on the fabrication so you’ll know how the clothes feel on you. · Spend quality time with your family instead of getting caught in traffic to the shopping mall. 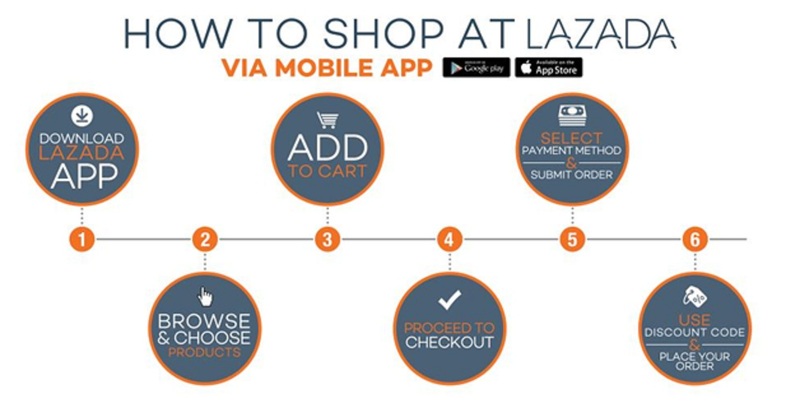 Shopping at the Lazada Mobile App lets you shop at your convenience, any time of the day! · Diapers and milk powder are not only expensive, but heavy to carry. Look out for online promotions and take advantage of door-step delivery. · Follow the Lazada Super Moms Facebook page and subscribe to the newsletters to get the latest deals delivered straight to you. · Don’t let getting overwhelmed in crowded malls and toy stores stop you from giving the best to your kids. Shop for educational toys online, conveniently. · If you’ve brought the wrong size of maternity clothes, take advantage of Lazada’s 100% Satisfaction Guaranteed policy. Return the wrong size within 14 days (30 for Vietnam), and re-order the outfit in the right size. · Online shopping allows you to compare prices for your favourite gadget. Do keep a look out for sellers on the same site that may offer a bigger discount or bundle deal. · Searching for phone accessories, power banks and covers is less overwhelming online as you can easily compare your options and colors, and sort them by price. · Subscribe to Lazada’s newsletter or like our Facebook page to get news on exclusive and limited edition tech launches. · When looking for a gadget in a specific model or colour, check out Lazada’s wide range online first. It’s better than visiting the retail store and discovering the gadget’s sold out. · Shopping for your favourite gadget online is easy. You can do it anytime of the day with fast and reliable delivery to your home or office. · Take advantage of free shipping if you spend a certain amount, or do a group order with friends so you can all enjoy free shipping. · Download the Lazada mobile application to enjoy special app-only discounts and access sales anywhere, anytime! Turn on push notifications on mobile to stay updated on the latest promotions. · Watch out for time-sensitive flash deals, set your alarm so you don’t miss the promotion! · Look out for exciting promotions from our bank partner with store-wide discounts. · Sign up for newsletters for sale promotions and coupon codes. · “Like” the Lazada Philippines (www.facebook.com/LazadaPhilippines) on Facebook to get notifications on the latest deals. · To have a truly effortless mobile shopping experience, download the Lazada Mobile App and join Lazada’s Big App Sale happening this August 27-31 and enjoy as much as 80% discount from your favourite brands. The Lazada Big App Sale: A Shopping Treat for all those Shoppers On-The-Go! Lazada Philippines is again rolling out five (5) days of non-stop shopping deals for all Filipinos to enjoy. Packed with deals, discounts, and games, the Lazada Big App Sale (www.lazada.com.ph/big-app-sale-days/) is Lazada Philippines’ way of making shopping more enviably effortless, enjoyable, and fun for Filipinos through the Lazada Mobile App. With as much as 80% exclusive discounts on bestsellers and favorite brands, the Lazada Big App Sale boasts hundreds of thousands of products all housed in the Lazada Mobile App. 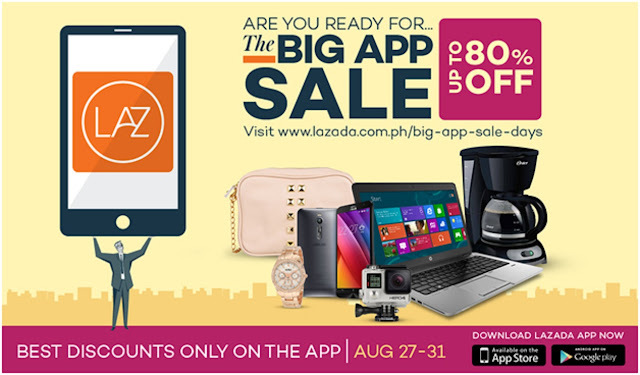 So save and shop now with the Lazada Mobile App and be part of the Lazada Big App Sale(www.lazada.com.ph/big-app-sale-days/) this August 27-31. Lazada(www.lazada.com.ph) is Philippines’ largest online shopping mall and is pioneering e-commerce by providing a fast, convenient and secure online shopping experience combined with an extensive product offering in categories ranging from mobiles & tablets and consumer electronics to household goods, toys, fashion and sports equipment. Lazada is continuously striving to offer its customers the best possible shopping experience with multiple payment methods including cash on delivery, extensive warranty commitments and free returns. Lazada mobile applications for Android, iPhone and iPad provide additional convenience to its consumers’ allowing them to shop anywhere, anytime. For more information, please visithttp://www.lazada.com.ph. For updates on Lazada’s latest innovations, as well as activities, contests and promotions, connect with us via Facebook (https://www.facebook.com/LazadaPhilippines). 2nd Generation Honda TMX Supremo!